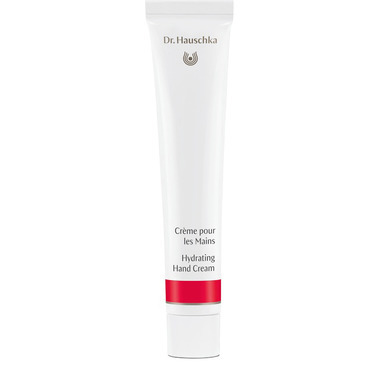 Dr. Hauschka’s Hydrating Hand Cream soothes, nourishes and protects hands from cold, harsh or dry conditions. With intense regenerative and hydrating properties supporting the skin’s natural process of renewal, this Hydrating Hand Cream is sure to leave your hands soothed and smooth. Usage: Apply regularly to soothe, moisturize and protect dry, overworked hands. This is a superior hand cream if you have serious skin issues. It is my go-to cream for the eczema on the tops of my hands and wrists. It's the only cream that does not sting at all when I am in the midst of a flare-up. It offers instant relief for dryness, itch, & the pain of eczema. I no longer get open sores. It's not my favourite scent- an herbal scent that's a bit intense to my nose but the benefits far out weigh that point. For the 6 months of cold in Eastern Canada, I cannot be without it. It's pricey but I don't need huge dollops for it to work effectively. Living on the west coast of Canada I am use to moist air. With family in Alberta winter visits can be absolutely painful to my skin, especially my hands. Dr. H's hand cream is my saviour. This is by far the best product I have ever used. It soaks into your skin super fast and you never have a nasty oily feel. The smell is calming and comforting which being mild enough to use all day.